The Ilocos region or Region I (Ilokano: Rehion ti Ilocos, or Deppaar ti Ilocos ; Pangasinan: Rihiyon na Sagor na Baybay na Luzon (Region at the Northwest Coast of Luzon)) is a Region of the Philippines and is located in the northwest of Luzon. It borders to the east the regions of the Cordillera Administrative Region and Cagayan Valley and to the south the region of Central Luzon. To the west north is the South China Sea. The region is composed of four provinces, namely: Ilocos Norte, Ilocos Sur, La Union and Pangasinan. Its regional center is San Fernando City, La Union. Ilocano speakers compose 66% of the region, and Pangasinan speakers are 27%, and the Tagalogs compose 3%. 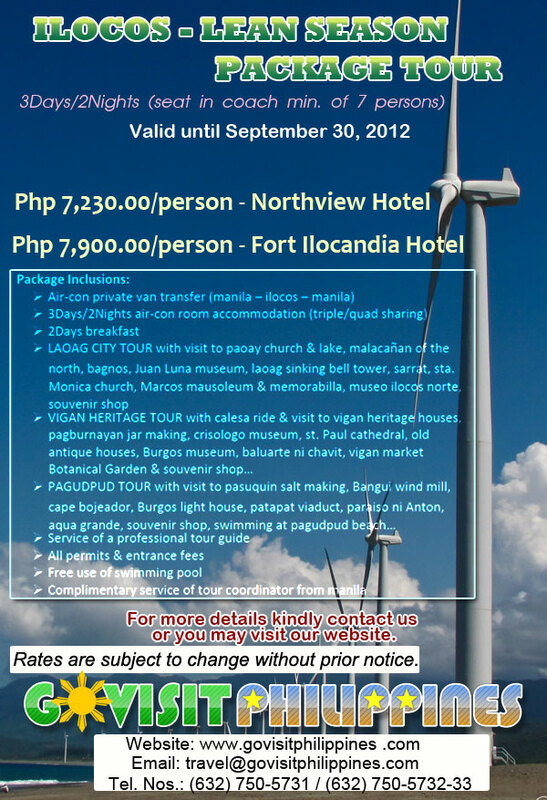 This entry was posted in Book with Us!, Land Arrangement Packages, Philippine Tours. Bookmark the permalink.